We’ve just passed the Chinese New Year, and we’ve entered the Year of the Dragon. I didn’t realize when I started this blog, but it does seem fitting. Dragons have a long and rich history in Chinese folklore, as they do in Western countries. For the purpose of the zodiac, the dragon is one of twelve animals in a fixed rotation, one for each calender year. These years are also influenced by elements such as fire and wood, making Chinese astrology fully as complex as the Western counterpart. In today’s competitive business world, it’s no wonder many Chinese try to make sure their children are born in the Year of the Dragon. Episode #3 of my podcast is now available. You can get it on Podbean or through my web site, here. I’d love to hear what you think, so please leave a comment. Hot Mountain erupts, and the wyrmlings are separated in the chaos. Includes chapters 5 and 6 of the novel. Jeremy Thatcher is one of my favorite dragon books, written by one of my favorite writers, Bruce Coville. It’s part of his “Magic Shop” series. In each of these books, a kid with a problem stumbles into ownership of an amazing magical item or creature. Thus Jeremy ends up raising a spirited baby dragon named Tiamat. The adventures of this unlikely pair are full of humor and misunderstandings, yet also touching as Jeremy finally realizes his “pet” is simply too big to deal with. Other books in the series include The Monster’s Ring, The Skull of Truth, Jennifer Murdley’s Toad, Juliet Dove, Queen of Love, and The Mask of Eamonn Tiyado. Although this book is the only one in the series that stars a dragon, Coville consistently shines a humorous light on misunderstood creatures like aliens and toads. Coville is also the author of many other series, including “I Was A Sixty-Grade Alien,” “The Unicorn Chronicles,” and “My Teacher” (was an alien). Several of these include dragons, too. I especially recommend Thor’s Wedding Day for a hilarious take on Norse mythology. Once you become a Coville fan, you’ll never run out of things to read! No, I’m afraid I don’t believe there ever were giant, winged, fire-breathing reptiles on Earth. Still, it’s fascinating to wonder how the legends got started. Pictured below is one possible seed of dragons in folklore. It’s the skull of a cave bear (Ursus spelaeus). 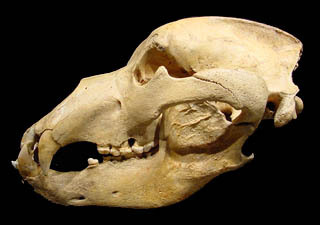 Cave bears were an ice age mammal who thrived all over Europe and into Asia between 200,000 and 20,000 years ago. Presumably they were omnivores (eating both meat and vegetation) like their modern relatives. We do not know that they lived all their lives in caves (modern bears don’t) but most of their fossils have been found in caves, where the protected environment helped preserve them. Like many ice age mammals, cave bears were considerably larger than their modern kin. On their hind legs, they could stand 10 feet or more! These impressive animals certainly coexisted with early humans. Neanderthals paid particular attention to cave bears and left many skulls behind in their fossil sites. They may even have worshipped cave bears. As time marched on, both cave bears and their Neaderthal neighbors were forgotten by modern humans who came to inhabit Europe. These later residents found skulls of cave bears, and seem to have speculated about what these creatures could have been. Even into contemporary times, some museums in Central Europe exhibit “dragon skulls” that actually are from cave bears. Ice Age Cave Bear, written by Barbara Hehner and Mark Hallett, published by Crown Books for Young Readers. Masters of Air & Fire is a podcast novel for kids aged 8-12, although I hope it can be enjoyed by all ages. This is episode 2 of 16. It includes chapters 3 and 4 of the novel. Approximate play time, 15 minutes. In this episode, Wrotha makes the wrenching decision to leave Hot Mountain, but does the wyrm familyhave time to escape before the volcano erupts? For whatever reason, I’m having problems getting the episode up to Podbean, but you can click here to open it from my web site. Time Notes. Chapter 3, 1:19; Chapter Break, 7:14; Chapter 4, 7:44; End Credits, 14:26. Total run time is 15:55. Thanks for listening. Please tell me what you think! Q: What is a dragon’s favorite seasoning? I’ve spent some time looking back at authors whose dragon books influenced me in the past, but now I’d like to mention an ongoing series of today. (Living authors need love, too!) Age of Fire by E. E. Knight follows the adventures of some young dragons struggling to survive in a hostile world. I love this approach as it makes the dragon characters fully independent rather than pets of the human characters. Indeed, I did this myself with my middle grade novel, Masters of Air & Fire — I already had one or two drafts under my belt when I discovered Knight’s series. Knight’s work and mine are not related, more a case of “convergent evolution,” if you will. There are six books in Knight’s series to date: Dragon Champion, Dragon Avenger, Dragon Outcast, Dragon Rule, Dragon Strike and Dragon Fate. From Knight’s web site, it’s hard to tell if there will be more. I’ve read two of these, am midway through the third, and enjoy them all. One obvious challenge is that (at least in the first three books) the main characters are experiencing the same initial events. Knight does a good job making each viewpoint unique, and from there he develops each dragon’s life distinctly. In Dragon Champion, one dragon stops cruel humans from stealing dragon eggs and domesticating the hatchlings. In Dragon Avenger, a girl dragon becomes an imperial citizen and uses her privileges to seek revenge . In Dragon Outcast, the third stumbles into a different empire where the dragons are the overlords. As a caution, these books are written for adults, not children. The subject matter is hard-hitting, the vocabularly difficult, and the philosophical concepts likely too complex for kids. There’s a lot of dog-eat-dog feel, which not every parent may like for their young readers. But if you want to explore a different view of dragons, these books are for you.